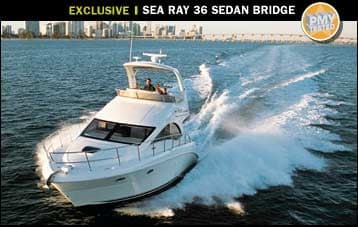 It had been just about a year since I&apos;d tested my last gasoline-powered boat when I stepped aboard the Sea Ray 36 Sedan Bridge, and boy, had things changed. Not so much with boats, but rather with gasoline. See, that very day, oil had hit $70 a barrel for the first time, causing ripples in financial markets and, more relevant to my endeavor, making three- and maybe four-dollar-a-gallon gasoline at the fuel dock a sure thing and so calling into question the viability of gasoline power in boats of this size. 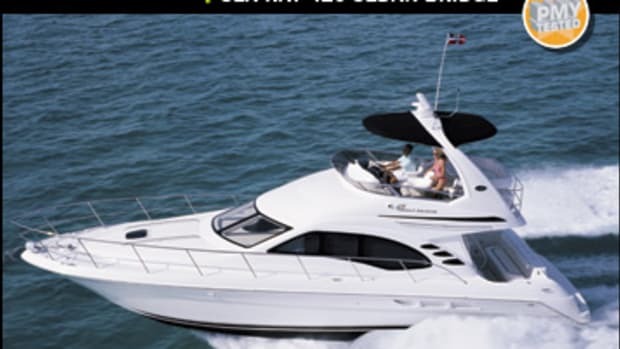 The advantages of gasoline power in a mid-30-footer are pretty clear. First is low purchase price. The 36&apos;s BH (before haggling) price is $345,903, not bad for a well-equipped cruiser. The upgrade to Cummins MerCruiser QSB 380 diesels will nick you for $63,017, or an additional 18 percent. Is it worth it? That depends on how much gasoline costs, how many hours you log annually, and what kind of a trade-in premium those diesels will yield in your area. So, basically, the gasoline-versus-diesel issue comes down to economics, right? Not entirely, and the 36 shows why. First, her MerCruisers make her way quicker out of the hole and more responsive through the midrange than any diesel could—and yes, that includes common-rail diesels. Combined with responsive power-assisted steering--standard with gasoline power but optional with diesels—and big rudders, the 36 is a ball to run. And those big V-8s are smoother and quieter (thanks also to underwater exhausts) than diesels. On the other hand, they&apos;re also wider, which means only 11 inches between the engines. (The QSB 380s are in-line sixes, narrower but longer.) A cockpit hatch provides access to the lazarette and optional Kohler genset, which is aft but, as far as the engine goes, not much more than the marine gears. You can&apos;t even see the dipsticks (hidden behind a floor brace) or fluid reservoirs from here. To check them you must roll up the standard saloon carpet—no easy task—then lift a hatch that leads to the forward part of the engine room. Things are still tight—you step off the ladder right onto the float switch, and the only place to sit is on the bottom rung—but everything is reachable, although the dipsticks are way aft and require a stretch. 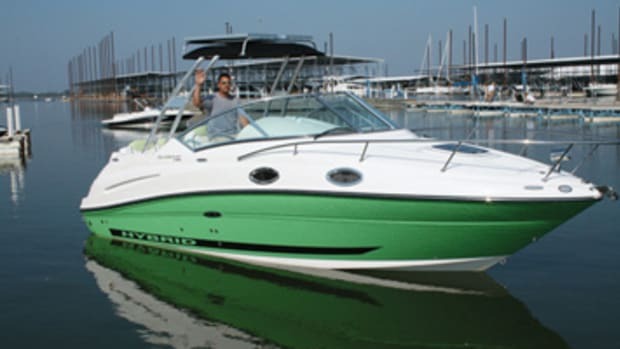 I suspect less-scrupulous boaters will forego the daily fluid checks, and as for changing oil and filters, I highly recommend an automatic unit like the Oil X-Change-R, which unfortunately I did not see on the 36&apos;s options list. Of course, the V-8s are also thirstier, knocking back a little more than 62 gph at WOT. But 0.70 mpg at 23 mph (3500 rpm) isn&apos;t bad. Worth noting also is the fact that like all diesels, the Cummins MerCruisers can be cruised at 90-percent throttle all day long, where gasoline mills like the MerCruisers do best (and last longer) at 3800 rpm or less. In other words, you&apos;ll be able to cruise faster and more economically with the diesel option. Which might be an important factor, since this boat invites horizon-chasing. 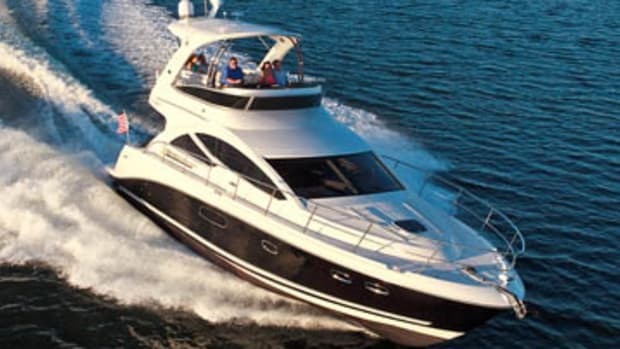 Her flying bridge is both comfortable and practical, offering good sightlines and an excellent driving position from one of two comfortable pedestal bucket seats. SmartCraft monitors and dedicated room for displays (our boat had optional twin Northstar 6000is) make for a simple, easy-to-read instrument panel. 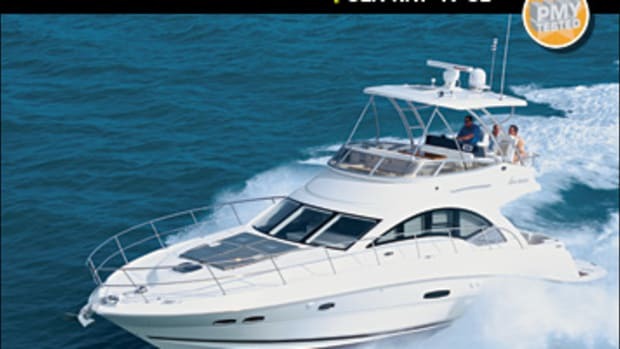 And while you&apos;re enjoying the 36&apos;s nimbleness, your guests will be appreciating the large L-shape settee and table aft, also a great place to hang out after you drop the hook. Our boat had the optional hardtop, which I would order for the shade it provides, even though to my eye it makes the boat seem a bit top-heavy. The cockpit is just as passenger-friendly. A little more than five feet deep, it has stylish rounded aft corners, a design that takes up some usable space but also yields safe, molded-in steps to the bridge and side decks. The complex molding here intrigued me: The deck of the standard swim platform (with standard transom door) and cockpit are one piece, eliminating leaks and squeaks. I also liked the stowage/shore-power hookup/compartment in the transom, a feature borrowed from larger Sea Rays. And I liked the saloon. Its facing two-person settees, aft entertainment module with standard 20-inch LCD TV and 12-volt Clarion stereo system, and glass all around make for a convivial space. 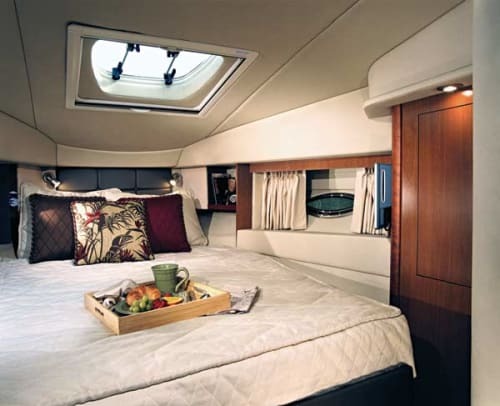 Because the L-shape dinette forward is elevated to make room for the two-berth stateroom below, the view while dining is excellent on all points. (The 36 is available with a lower station in place of the dinette.) 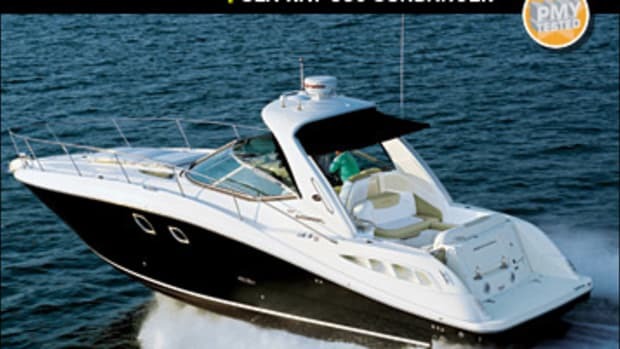 Neither the dinette nor either settee converts to a berth, no big deal since the boat has two cabins. 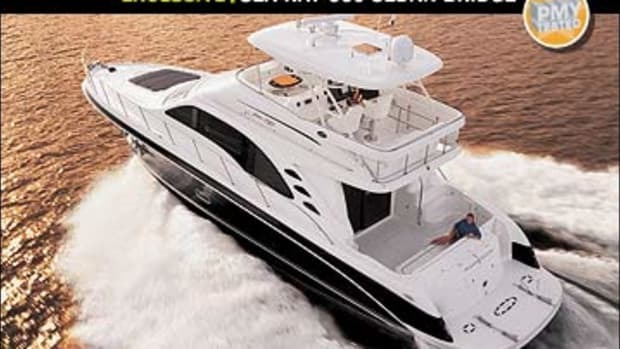 Within arm&apos;s reach of the dinette, the galley is efficient and well-outfitted, with side-by-side, dual-voltage, below-counter refrigerator and freezer, lots of stowage, and, like the dinette, an attractive cherrywood sole, which is unfortunately not available in the rest of the boat. (It would sure make those fluid checks a lot easier.) There&apos;s also an in-sole stowage compartment—nicely gelcoated—that&apos;s perfect for canned goods and another smaller space under the steps that on my boat was mostly occupied by the optional central vac. 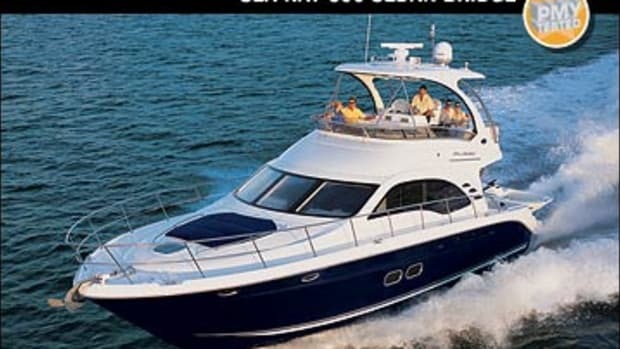 Directly to starboard, the guest stateroom, roomy for a 36-footer, is available with an LCD TV. 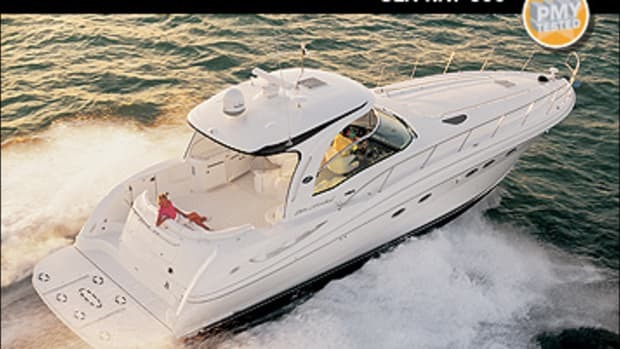 Somehow, Sea Ray also managed to fit in a separate head (port) and shower (starboard) and a large, comfortable forward master with island berth. Nice space planning. But the 36&apos;s real sleight of hand is handling. She may look a bit top-heavy, but she sure doesn&apos;t feel that way—and that&apos;s with the lighter gasoline powerplants. Stability and helm response are top-notch. I can&apos;t say anything of her rough-water abilities, as there was barely chop on our test waters. Handling calls to mind one other gasoline-diesel issue: docking. Gasoline engines lack diesels&apos; low-end torque and so swing smaller props. 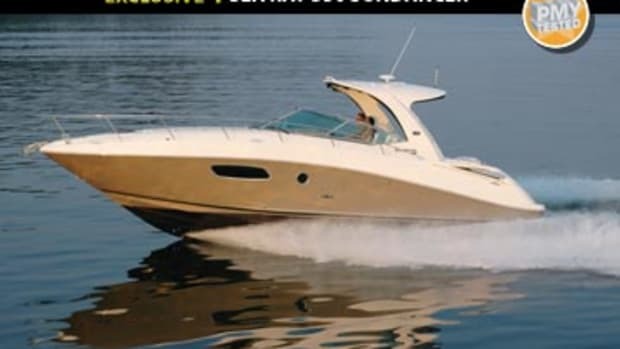 So when you put a gasoline boat in gear, not much happens unless you add throttle, which is difficult to do with split throttles and shifts like the 36&apos;s. Fortunately, both bow and stern thrusters are available, and on this boat the two can be controlled by a nifty, intuitive, boat-shape control. But when I went to back the 36 into her slip in a mild cross wind, I failed miserably. I did much better with the tiny props and split controls. That&apos;s no criticism of the boat but rather an old dog revealing a new trick he couldn&apos;t master. Yet this old dog was charmed by the 36. She&apos;s an affordable, well-equipped, well-designed cruiser. As for whether to order yours with gasoline engines or diesel—well, as I write this, not yet a week after my test, crude just hit $74 a barrel, so as the ol&apos; pirates used to say, pick yer poison, matey.